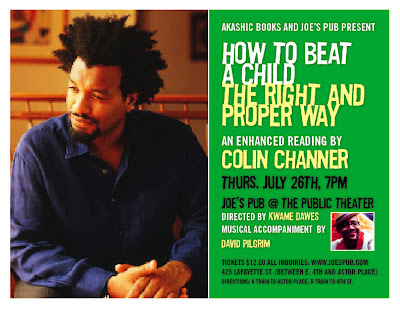 David Pilgrim will be accompanying his friend, well-known author COLIN CHANNER for the enhanced reading of his piece HOW TO BEAT A CHILD THE RIGHT AND PROPER WAY at JOE?S PUB, THURSDAY, JULY 26! The show is directed by Jamaican poet and playwright KWAME DAWES. Edging ever closer to Broadway, folks! DIRECTIONS: 6 train to Astor Place, R train to 8th st.